1 Auden, W. H., “Musée des Beaux Arts,” in Poems, selected by Fuller, John (London: Faber and Faber, 2000 ), p. 29. 2 For similar, but nonidentical, taxonomy of responses to reform, see Hirschman, Albert O., The Rhetoric of Reaction: Perversity, Futility, Jeopardy (Cambridge, Mass. : Belknap Press, 1991). 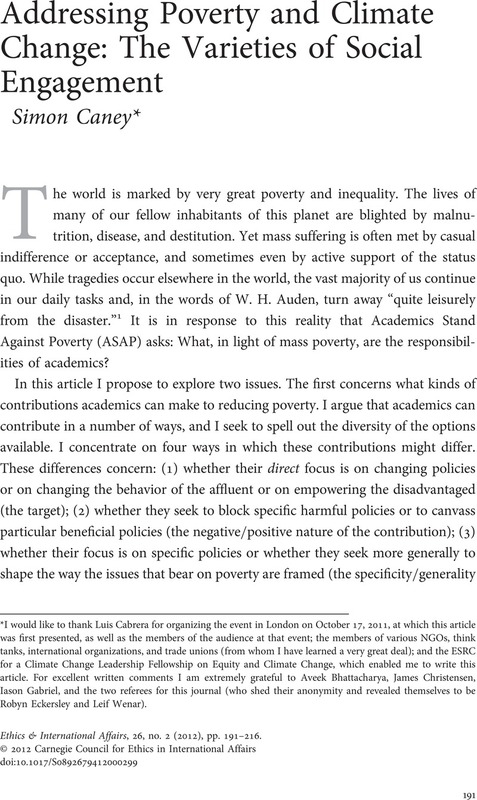 3 See Luis Cabrera and Thomas Pogge, “Academics Stand Against Poverty: An Idea Whose Time Has Come,” in this issue. 4 Solomon, Susan, Qin, Dahe, and Manning, Martin, “Technical Summary,” in Solomon, Susan et al. , eds., Climate Change 2007: The Physical Science Basis—Contribution of Working Group I to the Fourth Assessment Report of the Intergovernmental Panel on Climate Change (Cambridge: Cambridge University Press, 2007), p. 70. 5 Hare, Bill, “Relationship Between Increases in Global Mean Temperature and Impacts on Ecosystems, Food Production, Water and Socio-Economic Systems,” in Schellnhuber, Hans Joachim et al. , eds., Avoiding Dangerous Climate Change (Cambridge: Cambridge University Press, 2006), p. 179. 7 See Commission of the European Communities, “Winning the Battle Against Global Climate Change” (issued on February 9, 2005), p. 3; eur-lex.europa.eu/LexUriServ/site/en/com/2005/com2005_0035en01.pdf. 8 Rachel Warren, “Impacts of Global Climate Change at Different Annual Mean Global Temperature Increases,” in Schellnhuber et al., p. 95. 10 See Tickell, Oliver, Kyoto 2: How to Manage the Global Greenhouse (London: Zed Books, 2008); Barnes, Peter, Who Owns the Sky? Our Common Assets and the Future of Capitalism (Washington, D.C.: Island Press, 2001); and Barnes, Peter et al. , “Creating an Earth Atmospheric Trust,” Science 319, no. 5864 (2008), p. 724. 11 See Onora O'Neill's contribution to this special issue, where she argues that academics are not a natural kind and thus raises the question of whether a focus on the role of academics is appropriate. 13 One might also include under this heading campaigns to change the policies of economic corporations as well as governments. 14 For a debate surrounding these issues, see Kuper, Andrew, “More Than Charity: Cosmopolitan Alternatives to the ‘Singer Solution,’” Ethics & International Affairs 16, no. 1 (2002), pp. 107–20; Singer, Peter, “Poverty, Facts, and Political Philosophies: Response to ‘More Than Charity,’” Ethics & International Affairs 16, no. 1 (2002), pp. 121–24; Kuper, Andrew, “Facts, Theories, and Hard Choices: Reply to Peter Singer,” Ethics & International Affairs 16, no. 1 (2002), pp. 125–26; and Singer, Peter, “Achieving the Best Outcome: Final Rejoinder,” Ethics & International Affairs 16, no. 1 (2002), pp. 127–28. 15 For examples, see Benkler, Yochai, The Wealth of Networks: How Social Production Transforms Markets and Freedom (New Haven, Conn.: Yale University Press, 2006), chap. 9. 16 Anderson, Kym, “Subsidies and Trade Barriers,” in Lomborg, Bjørn, ed., Global Crises, Global Solutions (Cambridge: Cambridge University Press, 2004), pp. 541–77. 17 For information, see www.un-redd.org/. 18 For discussion of these concerns, see Nuffield Council on Bioethics, Biofuels: Ethical Issues (London: Nuffield Council on Bioethics, 2011), chap. 2, esp. pp. 28–41; www.nuffieldbioethics.org/sites/default/files/Biofuels_ethical_issues_FULL%20REPORT_0.pdf. Disclosure: I am one of the members of the working party that produced this report. 19 Ibid., chap. 4, esp. p. 64. 20 See Tobin, James, “A Proposal for International Monetary Reform,” Eastern Economic Journal 4, nos. 3–4 (1978), pp. 153–59. 21 For the work of Thomas Pogge and his associates on the Health Impact Fund, see www.yale.edu/macmillan/igh/. See, in particular, Thomas Pogge, Hollis, Aidan, and Pogge, Thomas, The Health Impact Fund: Making New Medicines Accessible for All (Incentives for Global Health, 2008); and Pogge, Thomas, Rimmer, Matthew, and Rubenstein, Kim, eds., Incentives for Global Public Health: Patent Law and Access to Essential Medicines (Cambridge: Cambridge University Press, 2010). See also Kremer, Michael and Glennerster, Rachel, Strong Medicine: Creating Incentives for Pharmaceutical Research of Neglected Diseases (Princeton, N.J.: Princeton University Press, 2004). 22 See Wenar, Leif, “Property Rights and the Resource Curse,” Philosophy and Public Affairs 36, no. 1 (2008), pp. 2–32. See, more generally, the papers at wenar.info/CleanTrade.html. 24 Ibid., pp. 140–41; compare also pp. 142ff. See also Natural Resource Charter, www.naturalresourcecharter.org/. 25 Reddy, Sanjay G. and Pogge, Thomas, “How Not to Count the Poor,” in Anand, Sudhir, Segal, Paul, and Stiglitz, Joseph E., eds., Debates on the Measurement of Global Poverty (New York: Oxford University Press, 2010), pp. 42–85. 26 Parry, Martin et al. , eds., Climate Change 2007: Impacts, Adaptation and Vulnerability—Contribution of Working Group II to the Fourth Assessment Report of the Intergovernmental Panel on Climate Change (Cambridge: Cambridge University Press, 2007). 27 I have sought to do this in Caney, Simon, “Climate Change, Human Rights and Moral Thresholds,” in Humphreys, Stephen, ed., Human Rights and Climate Change, with a foreword by Mary Robinson (Cambridge: Cambridge University Press, 2010), pp. 69–90. See also International Council on Human Rights Policy, Climate Change and Human Rights: A Rough Guide (Versoix, Switzerland: International Council on Human Rights Policy, 2008); www.ichrp.org/files/reports/45/136_report.pdf. Disclosure: I was an advisor for this report. 28 Archer, David, The Long Thaw: How Humans Are Changing the Next 100,000 Years of Earth's Climate (Princeton, N.J.: Princeton University Press, 2009), p. 1. 29 Ramsey, F. P., “A Mathematical Theory of Saving,” Economic Journal 38, no. 152 (1928), pp. 543–59. 30 See Stern, Sir Nicholas, The Economics of Climate Change: The Stern Review (Cambridge: Cambridge University Press, 2007), p. 52; and Nordhaus, William, A Question of Balance: Weighing the Options on Global Warming Policies (New Haven, Conn.: Yale University Press, 2008), p. 33. 31 For a helpful discussion of η, see Beckerman, Wilfred and Hepburn, Cameron, “Ethics of the Discount Rate in the Stern Review on the Economics of Climate Change,” World Economics 8, no. 1 (2007), pp. 193ff. 32 Benkler, The Wealth of Networks, pp. 329–44 (on food security), and pp. 344–53 (on access to medicines). 33 For discussion, see Barnett, Jon and Campbell, John, Change and Small Island States: Power, Knowledge and the South Pacific (London: Earthscan, 2010). 34 See Singer, Peter, The Life You Can Save: How to Play Your Part in Ending World Poverty (London: Picador, 2009), chap. 6. See also Keith Horton's contribution to this issue for an excellent discussion of the role that academics can play in evaluating the effectiveness of aid programs. 35 See GiveWell at givewell.org/. For Singer's discussion of GiveWell and its founders, see Singer, The Life You Can Save, pp. 81–93. Note also that Giving What We Can recommends charities (www.givingwhatwecan.org/resources/recommended-charities.php) and that it has drawn on GiveWell, among other organizations (www.givingwhatwecan.org/resources/our-methodology.php). For Wenar's critique, see Wenar, Leif, “Poverty Is No Pond: Challenges for the Affluent,” in Illingworth, Patricia, Pogge, Thomas, and Wenar, Leif, Giving Well: The Ethics of Philanthropy (New York: Oxford University Press, 2011), pp. 124–26. 36 On the problems of assessment, see Wenar, Leif, “What We Owe to Distant Others,” Politics, Philosophy and Economics 2, no. 3 (2003), pp. 291–96, esp. pp. 294 and 296; Wenar, Leif, “Accountability in International Development Aid,” Ethics & International Affairs 20, no. 1 (2006), pp. 18–20; and Wenar, “Poverty Is No Pond,” pp. 108–23, esp. pp.118–23. For the role that academics might play, see Wenar, “What We Owe to Distant Others,” p. 297; and Wenar, “Poverty Is No Pond,” p. 128. For a different approach, see Wenar, “Accountability in International Development Aid,” pp. 17–23. 37 Buchanan, Allen, “Social Moral Epistemology,” Social Philosophy and Policy 19, no. 2 (2002), p. 126. See also Buchanan, Allen, “Philosophy and Public Policy: A Role for Social Moral Epistemology,” Journal of Applied Philosophy 26, no. 3 (2009), pp. 276–90. 38 For the latter, see Singer's overview of the beliefs of Americans concerning how much aid they think Americans donate to overseas aid in Singer, The Life You Can Save, pp. 33–35. 39 This is a point that has often been pressed by Onora O'Neill; see, e.g., her critique of accounts that treat rights as basic in O'Neill, Onora, Towards Justice and Virtue: A Constructive Account of Practical Reasoning (Cambridge: Cambridge University Press, 1996), esp. pp. 128–34. 40 My source of information is Pogge, Thomas, “Shue on Rights and Duties,” in Beitz, Charles and Goodin, Robert, eds., Global Basic Rights (Oxford: Oxford University Press, 2009), p. 125, fn11. Pogge cites Alston, Philip and Tomaševski, Katarina, eds., The Right to Food (Dordrecht, Neth. : Martinus Nijhoff, 1984); and Eide, Asbjorn, Eide, Wenche Barth, Goonatilake, Susantha, and Gussow, Joan, eds., Food as a Human Right (Tokyo: United Nations University, 1984), pp. 169–74. 41 Shue, Henry, Basic Rights: Subsistence, Affluence, and U.S. Foreign Policy, 2nd ed., with a new afterword (Princeton, N.J.: Princeton University Press, 1996), p. 60. 42 See www.business-humanrights.org/media/documents/ruggie/ruggie-guiding-principles-21-mar-2011.pdf. I am grateful to Leif Wenar for drawing my attention to this. 43 For an example, see Academics for Higher Education & Development, www.ahed-upesed.org/. 44 United Nations Development Programme, Human Development Report 2005: International Cooperation at a Crossroads—Aid, Trade and Security in an Unequal World (New York: Oxford University Press, 2005), p. 146. 45 Roberts, J. Timmons and Parks, Bradley C., A Climate of Injustice: Global Inequality, North-South Politics, and Climate Policy (Cambridge, Mass. : MIT Press, 2007), pp. 14–19. 46 For a similar but nonidentical approach, see David Wiens's instructive discussion in “Toward a Pragmatic Moral Theory of State Sovereignty,” Public Reason blog, November 7, 2008; publicreason.net/2008/11/07/ppps-toward-a-pragmatic-moral-theory-of-state-sovereignty/. In contrast to Wiens, I think that decision-making in nonideal circumstances ought to be informed by an understanding of the ideal. See Wiens, David, “Prescribing Institutions Without Ideal Theory,” Journal of Political Philosophy 20, no. 1 (2012), pp. 45–70. 47 See here ASAP's own initiative along the lines I am canvassing (and the fact that it too uses the idea of an overlapping consensus): asap.betaelements.net/projects/the-global-poverty-consensus-report/. 48 Rawls, John, Political Liberalism (New York: Columbia University Press, 1993), p. 144. 50 Wright, Erik Olin, Envisioning Real Utopias (London: Verso, 2010), p. 273; compare pt. III. 51 My distinction is similar in spirit to G. A. Cohen's distinction between “rules of regulation” and “fundamental principles.” Cohen, G. A., Rescuing Justice and Equality (Cambridge, Mass. : Harvard University Press, 2008), pp. 3, 19–21, 253–54, 263–72, 276–79, 283, 285–86, and 323–27. But I think the two distinctions are not coextensive. Normative policy-oriented reasoning is focused on specific policies (e.g., the Tobin tax or reducing tariffs), not rules. It operates at a different level of specificity. The difference is apparent when we recall that Cohen maintains that what the parties in Rawls's Original Position would be choosing are “rules of regulation” (and not principles of justice). However plausible this is (and I am sympathetic to Cohen's claims) it is clear that the parties are not selecting specific policies. Rules of regulation are the rules that should govern social life, whereas policies are the means by which to achieve rules of regulation. 52 Clearly my remarks here bear on the recent debates on the value or otherwise of ideal theory and its relationship to nonideal theory. Space precludes defending my position in full. My views on ideal theory are close to those defended by Estlund, David, Democratic Authority: A Philosophical Framework (Princeton, N.J.: Princeton University Press, 2008), chap. XIV; Gilabert, Pablo, “Comparative Assessments of Justice, Political Feasibility, and Ideal Theory,” Ethical Theory and Moral Practice 15, no. 1 (2012), pp. 39–56; Stemplowska, Zofia, “What's Ideal About Ideal Theory?” Social Theory and Practice 34, no. 3 (2008), pp. 319–40; and Swift, Adam, “The Value of Philosophy in Nonideal Circumstances,” Social Theory and Practice 34, no. 3 (2008), pp. 363–87. 53 Simmons, A. John, “Ideal and Nonideal Theory,” Philosophy and Public Affairs 38, no. 1 (2010), pp. 21–22, 25, and 34–35, esp. p. 21; and Gilabert, “Comparative Assessments,” sect. 4.1, p. 14. 54 For the distinction between “difficulty” and “cost,” see Cohen, G. A., Karl Marx's Theory of History: A Defence (Oxford: Oxford University Press, 1978), pp. 238–40. 55 I am greatly indebted to, and draw here on, Arthur, W. Brian, Increasing Returns and Path Dependence in the Economy (Ann Arbor, Mich.: University of Michigan Press, 1994); Mahoney, James, “Path Dependence in Historical Sociology,” Theory and Society 29, no. 4 (2000), pp. 507–48; North, Douglass C., Institutions, Institutional Change and Economic Performance (New York: Cambridge University Press, 1990), esp. pp. 93–100; Page, Scott E., “Path Dependence,” Quarterly Journal of Political Science 1, no. 1 (2006), pp. 87–115; and Pierson, Paul, Politics in Time: History, Institutions, and Social Analysis (Princeton, N.J.: Princeton University Press, 2004), pp. 17–53. 56 Pierson, Politics in Time, pp. 54–78. 57 For a similar point made in a rather different context, see Gilabert, “Comparative Assessments,” p. 48. 58 See Barrett, Scott, Environment and Statecraft: The Strategy of Environmental Treaty-Making (Oxford: Oxford University Press, 2003), p. 222, fn3. 59 International Council on Human Rights Policy, Beyond Technology Transfer: Protecting Human Rights in a Climate-Constrained World (Versoix, Che. : International Council on Human Rights Policy, 2011); www.ichrp.org/files/reports/65/138_ichrp_climate_tech_transfer_report.pdf. Disclosure: I wrote a background paper for this report. 60 On the fallibility of experts, see Tetlock, Philip E., Expert Political Judgment: How Good Is It? How Can We Know? (Princeton, N.J.: Princeton University Press, 2005). 61 See, e.g., the differences in the explanation of global poverty given by Jeff Sachs and those given by others like Daron Acemoglu and James Robinson or by Dani Rodrik. See, e.g., Gallup, John Luke and Sachs, Jeffrey D., “The Economic Burden of Malaria,” American Journal of Tropical Medicine and Hygiene 64, no. 1, supp. (2001), pp. 85–96; Acemoglu, Daron and Robinson, James A., Why Nations Fail: The Origins of Power, Prosperity and Poverty (London: Profile Books, 2012); and Rodrik, Dani, One Economics, Many Recipes: Globalization, Institutions, and Economic Growth (Princeton, N.J.: Princeton University Press, 2007), pp. 184–92. 62 Kapur, Devesh, “Philanthropy, Self-Interest, and Accountability: American Universities and Developing Countries,” in Illingworth, , Pogge, , and Wenar, , eds., Giving Well, pp. 264–85. 64 I owe this point to Tim Kruger, who made this suggestion in a different context (geoengineering research). It is embodied in Steve Rayner et al., “Memorandum submitted by Tim Kruger (GEO 07): Draft Principles for the Conduct of Geoengineering Research,” submitted to House of Commons Science and Technology Committee enquiry into “The Regulation of Geoengineering,” para. 19, principle 3; www.publications.parliament.uk/pa/cm200910/cmselect/cmsctech/221/10011315.htm. * I would like to thank Luis Cabrera for organizing the event in London on October 17, 2011, at which this article was first presented, as well as the members of the audience at that event; the members of various NGOs, think tanks, international organizations, and trade unions (from whom I have learned a very great deal); and the ESRC for a Climate Change Leadership Fellowship on Equity and Climate Change, which enabled me to write this article. For excellent written comments I am extremely grateful to Aveek Bhattacharya, James Christensen, Iason Gabriel, and the two referees for this journal (who shed their anonymity and revealed themselves to be Robyn Eckersley and Leif Wenar).